Available both in bulk or in Tape & Reel packaging and in Carbon and Cermet substrates, the 9 and 14mm SMD potentiometers are joining the already existing 6mm CA6 SMD. Following the trend for surface mounting, ACP has completed its product range to cater to customers' requests and now all potentiometers are also available in this configuration. The mechanical characteristics will remain the same as for the potentiometers with through-hole terminals. 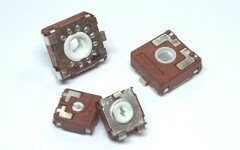 As shown on the picture, only vertical adjustment configuration will be available for these 9 and 14mm potentiometers. Standard resistance tolerance is +/- 25%. ACP can offer different tapers and study customizations: special tapers with constant value areas, different slopes and ohm values, lower tolerances, linearity below 3%, detents, etc. All ACP’s products are lead-free and compliant to RoHS requirements; they also withstand the soldering conditions required for lead-free components.